Nowadays we are all rushing around, trying to keep ahead of the increasing pressure of modern living that by the time you get home all you want to do is relax. upto date interior products on the market today, we also bring the showroom to you at home. Telephone us to discuss your exact requirements and we will arrange a date and time to visit you at your home and bring the various samples, take the exact measurements needed and start to bring your ideas to life. or Nursing Homes, Wine Bars Restaurants, Night Clubs, Architects & Specifiers. We understand that you need quality products but to fit the budget. Fire retardant blinds and fabrics, CS Yarns, modern and traditional designs, and all installed by experienced, CSCS qualified, insured and security checked fitters. the use of UV Filtering Blinds. by combining quality products, professional experience, a genuine concern to work to budget and an ongoing environment commitment. All backed up with a personal touch that comes with a family run, independently owned and operated business. 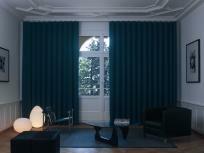 Are you an interior designer or curtain maker, who works from home? Are you a Retailer who has a client that wants a fabric that YOU don’t sell? If your in the Trade and can prove it, then we can help. Our Trade service is simple, we have a showroom so why don’t YOU use it! Bring your clients to our showroom to view the vast array of products available and we will give you a trade price on all of the products that YOUR client has chosen. We will even get the products delivered to us for you to collect or direct to you. We can even arrange a professional fitter to install them.